2016 Arbor Week: Trees Planted Between Storms! 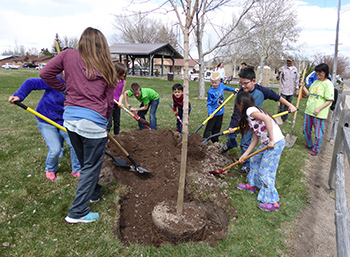 Three Alamosa parks have thirteen new trees thanks to the help of 39 volunteers, the Alamosa City Department of Parks and Recreation (ADP&R) staff, and the Donor Alliance. In between snow storms, five trees were planted on the south side of Boyd Park, three trees on the south side of Diamond Park, and five trees on the west side of Carroll Park. Trees for Boyd and Diamond were funded through the ADP&R and a $2,000 Colorado Tree Coalition/Xcel grant. 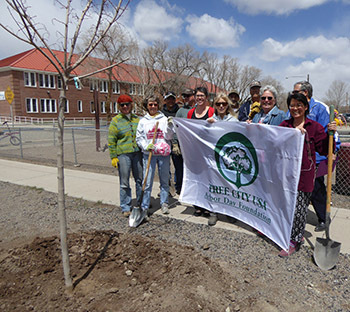 The grant was submitted by the ADP&R and the Alamosa Tree Board (ATB) with the goal of demonstrating appropriate selection and planting of trees under or near powerlines. The “Xcel Right Tree Selection” pdf file that lists appropriate trees for planting under or near distribution power lines can be downloaded from the ColoradoTrees.org website. After jumping off of the school bus, students eagerly dug in to plant three trees in Diamond Park. Note that the planting hole diameter is twice the diameter of the root ball. A newly planted Tatarian Maple. From left to right: Jan Oen, Karyl Scarlett (ATB), Dan Espinoza (ADP&R), Jeremy Arellano (ADP&R), Kristina Daniel (Alamosa City Council), Judy Luckhart, Solomon Archuleta (ADP&R), Dennis deHererra (ADP&R), Marilyn Loser (ATB), Audrey Liu (ATB), and Heinz Bergann (ADP&R). The Donor Alliance, based in Denver, funded five trees for Carroll Park. 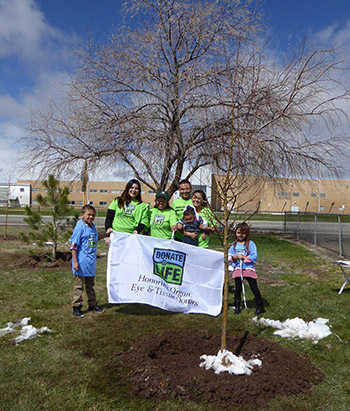 April is National Donate Life Month and kidney recipient Nieves Higareda, along with her family, Alamosa citizens, and ATB members helped plant the trees just south of the parking lot on the west side of the park in honor of her donor. Nieves received her kidney transplant two years ago and says she is doing well. Angelica Barajas of the Donor Alliance drove down to Alamosa from Denver during a snowstorm to help with the plantings. 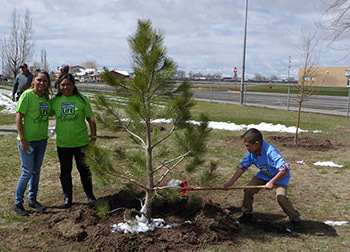 Above: Nieves Higareda (2nd from the left), kidney recipient, stands with her daughter while her grandson waters the newly planted Ponderosa with snow. A newly planted Spring Snow Crabapple is on the right. Right: Kidney recipient Nieves Higareda (center), her family, and Angelica Barajas of the Donor Alliance (2nd from left), stand by one of the Spring Snow Crabapples planted in honor of Nieves’ kidney donor. The new Ponderosa can be seen on the left. All the trees will receive mulch in the watering wells and will be surrounded by wire cages to protect them from deer. State Forester Vince Urbina recommends keeping the cages around the trees until their trunks measure four inches in diameter measured six inches above the ground. At that point, the bark is tough and the deer are less interested in chewing on them. Boyd Park now has a Tatarian Maple (Acer tataricum garann ‘Hot Wings’), a Canada Red Chokecherry (Prunus virginiana ’Shubert’), an Amur Chokecherry (Prunus maackii), a Washington Hawthorn (Crataegus phaenopyrum), and a Spartan Juniper (Juniperus chinensis 'Spartan'). Soon a Spring Snow Crabapple (Malus 'Spring Snow') and an Autumn Blaze Callery Pear (Pyrus calleryana 'Autumn Blaze) will be planted. La Garita nursery didn’t deliver them yet since they were beginning to bloom. A tree expends a lot of energy during bloom time, so it’s best not to further stress them through the disruption of transplanting. Diamond Park has a Bristlecone Pine (Pinus aristata – Colorado native), an Amur Flame Maple (Acer tataricum ginnala 'Flame'), and a Spartan Juniper. Carroll Park has a Ponderosa Pine (Pinus ponderosa – Colorado native) and four Spring Snow Crabapples (Malus ‘Spring Snow’ – unlike other crabapples these have white flowers and no messy fruit). For ATB recommended trees and tips on proper tree planting and maintenance, visit AlamosaTrees.net. Alamosa has been a Tree City for 26 years! ADP&R personnel do the heavy lifting. The planting wouldn’t happen without the cheerful efforts of Director Heinz Bergann and Staff Solomon Archuletta, Jeremy Arellano, Dennis deHererra, and Dan Espinoza. They dig the holes for the large trees with a back hoe, transport and place the heavy trees, as well as provide mulch and wire cages.